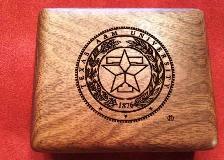 Has someone in your Aggie family done something noteworthy? Let our Aggie Family read the news! Just write a paragraph and email it to KHAMcommunication@gmail.com. Photographs in .jpg format are welcome! Congrats to all our local Aggies who ordered their rings last week! Whoop! They’ll be here in September before you know it! Moms, don’t forget our boutique sells these AMAZING ring boxes! Order yours now for September!